Okay, you may have seen these little belts everywhere…….so there’s not really one place to link everyone to. So I decided to teach my own tutorial……….the way that works best for me. Hope it helps. Can I just tell you first why children’s belts are great?!? Well the pants I buy for Elli rarely fit just right and thankfully more and more companies are making their pants with an adjustable waist. However, there are still some that aren’t adjustable and they fall right off Elli’s little bum. So these belts work perfectly. Okay, and they’re so cute. Perfect little splash of color. Yum. 2 pieces of 1 1/2 inch wide ribbon (The length depends on the size of the child’s waist…….I cut my 2 pieces 29 inches long because that gave my little Elli a little room to grow. **And she wears a 2T in clothing if that helps anyone decide about how much they’d need for their child. **If you use ribbon that is more narrow, make sure to buy smaller D-rings. Start by sewing the 2 pieces of ribbon together, wrong sides together. Make a seam right down the center of the ribbons and then another seam on the left and right sides, very close to the edge. And then sew close to the edge…..and then another seam right next to that one, to make it really secure. Then turn the ribbon over and fold over a 1/4 of an inch and then another 1/4 inch and sew 2 seams to secure the end. …..so that when you loop the end through the D-rings, the seams are hiding toward the inside. Keeps everything nice and neat. 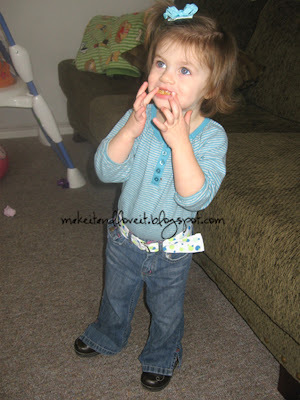 And here’s my little Elli, shoving a Nutri Grain Bar into her mouth. Bribery for photo sessions works wonders at this age. I really like this idea, as my three year old son Chase also has a skinny waist, but if I don’t buy the pants big enough they are too short in the leg! He has one belt like that, that came with a pair of jeans I bought him, and he really likes it. This would also be easy enough to make using any kind of material as well, and sewing it up almost like bias tape, so it would be easy to make for boys or girls. Thanks for sharing your idea! This is so super cute! You have some of the best ideas! I love them! Keep em coming! That’s it? Wow, that’s so super easy! Thanks for such a great idea!! Goodness knows my son needs some belts. 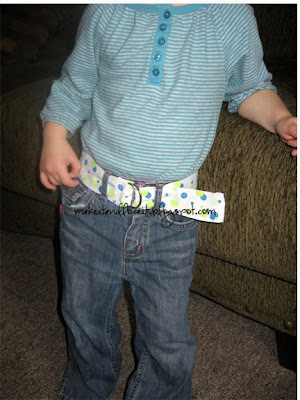 this is a great idea i am definetly going to try this my daughter is almost 4 and she is tall and super skinny little waist lol and i can't even find her belts that fit! i can't wait to try this thank you!! very cute and super quick! I'm making some for birthday gifts for my daughter's friends. They wear uniforms to school so it's nice to have cute accessories. Thanks! wow!use ribbon for belt? Brilliant idea. I just got a 1 inch d ring. does that mean the ribbon should be a 1 1/4 inch wide then? Lynn – It doesn't have to be…..it can be a little wider or a little more narrow. But now too much more narrow because then it won't hold as tightly. Just made one of these for my skinny 6 yr old. So quick and cheap. Thanks! I love that you used ribbon…the possibilities are endless! I made a toddler belt recently and my son feels so grown up! Thank you so much for this tutorial I am absolutely in love/addicted to your blog. I have found so many useful ideas from your site. I have four children ranging in age from two five year olds ( fraternal twins) , four (girl) & three (boy). I've learned to re-purpose my boys jeans into skirts for the girls, to use old shirts to patch knee holes, to use ribbon to make jeans last a little longer & now how to make belts for the twins; whose pants seem to never ever fit. Thank you so much your site has saved me time & time again. Thanks, My husband just said this morning that my 2 yr old needed a belt. I’m also going to JoAnn’s today so time to get the materials. I can whip it up tonight. Thanks for your generosity, sharing your ideas.